I wouldn’t have this self-created kind of website if it wasn’t for certain people in my life, and one of these is Barry. From first seeing his mandalas in 1985 I was struck by their outstanding progressiveness and power. I contacted him in 1987 when studying Tibetan meditation at Manjushri in London, and first saw the originals exhibited at the Festival of Mind-Body-Spirit in London in 1988. I own two originals, but my house is overrun with mandalas now, which include my pale imitations. Lana: What do you see as the link between Astrology and mandalas, and how has Astrology slotted into your life in relation to this? Barry: Philosophically speaking, my exploration of mandalas and astrology are part of my experience and expression of Oneness. Both the mandala and astrology are based on the principle that all are connected and One. Also the text which accompanies the mandala Sacred Centres expands further on the subject. Historically speaking, the experience of Oneness arose in my late teen years and was part of my interest in meditation, philosophy, art, mysticism and depth psychology. Astrology came along a few years later. The first time I remember someone calculating my chart was in my early 20’s when I was living in “hippy communes”. At that time there was some uncertainty about my exact birth time and therefore ascendant but my birth certificate clarified that some time later. In the ‘80’s I spent about five years in or near Glastonbury and it was then that I made a serious study of astrology, attended a number of courses and workshops about it and started drawing up charts which I continued to do into the ‘90’s. I drew up the charts by hand and used a design I made myself which had in the centre a mandala. My idea was to remind myself and others that all the energy, patterns and cycles and so on that astrology explores exist in the context of the unchanging absolute symbolized by the centre of the mandala. 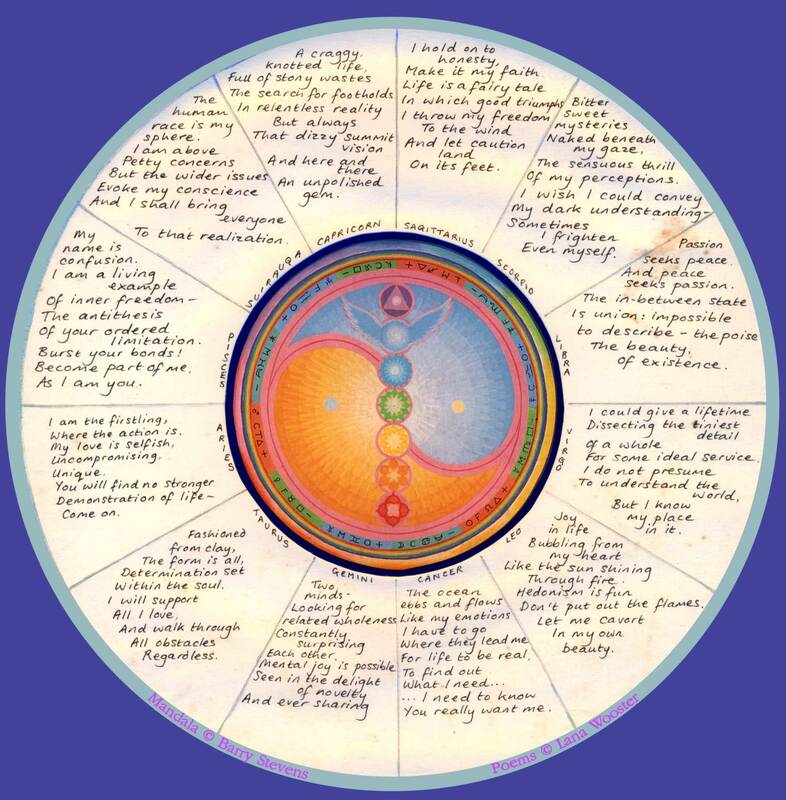 In 1987 I was contacted by Lana and commissioned to paint her chart which was a synthesis of my understanding of astrology and my mandala art work. This was completed at the time of the Harmonic Convergence. That led to various collaborative activities with Lana including putting together an unpublished book called “Open Space”. This writing process involved collaboration with Asia Haleem who was a literary agent at that time and for whom I painted a number of images of a mandalic nature for a book called The Atom & The Octave. Astrology continues to be one of my interests and I often turn to it for understanding at times of bewilderment!!! Lana: Well that is certainly a broad answer to a broad question. I hope this next question has enough bearing on your art. If not, feel free to extemporize…I have always been obsessed with the point between the manifest and the unmanifest, in creation. There has always been an unwillingness in me to move from non-writing to writing, and I find painting a painful exercise. Creativity obviously flows much more easily for you. Do you have anything to say about this point of creation of a mandala at the interface between the manifest and the unmanifest? Barry: Well the first point I’d like to make is that having seen you painting I am not sure how to take your statement that painting is painful…. Mystical expression is very close to dissolution. Mystical expression is very concise. The simplest words contain the most essence. than when there are words. than any externalised word or deed. I think it is true to say that in both instances I am resonating with what you are expressing re the manifest and unmanifest. On another level I would say that an alternative perspective is to consider the manifest and unmanifest to be two aspects of one whole and as in the yin yang symbol each polarity contains within itself the seed for the other. So in that context life is an ongoing dance in which differences of whatever nature are continuously interacting in a vast cosmic symphony. As I understand it we do not have any “choice” about any of this. As one teacher I came across said something along the lines that choice exists prior to the realization of Oneness. Post Oneness there is surrender. Choice is a subject that is given a lot of attention in our world both secular and “New Age spiritual”. I don’t think it has the same degree of attention in classical mysticism. As I understand it we have no choice about being creative or being manifest or unmanifest. It all arises in the vast expanse of consciousness which contains and transcends whatever the mind can conceive or not conceive. Alternative propositions such as being manifest or being unmanifest, being creative or not being creative, having choice & not having choice arise in the realm of duality. In the realm of Unity polarities arise and subside, change into each other, merge and dance. Being aware of that underlying Oneness is what I call “creativity”. It may well manifest or may well decide not to! One interesting interaction I once had relevant to this question was with someone who had been looking at one of the mandalas I call Shunyata. He was excited about it disappearing when he looked at it. Many people have had this experience with this particular image. In other words one moment you are looking at an image and the next moment an empty space. This was in a sense a culmination of my attempt to integrate and express the manifest and unmanifest as One. On another but related tack I recall being at a meditation retreat with Maharishi Mahesh Yogi about 1968. He was saying that in the state of God Realization the difference between the manifest and unmanifest are more or less non-existent. Other teachers go further and say that there never was two and that it is all one. My own understanding is that when consciousness is perfectly centred in the “I Am” unity is the primary experience. Manifestation and form arise but are seen to be in essence One. In terms of manifesting or not manifesting, I guess it’s true to say that manifestation has been my work in life in terms of mainly the mandala. However it seems to me it’s a two way process, the energy “pushes” through and also is “pulled” through. One is somehow a “conduit”! If the push and pull are strong enough, manifestation happens! Lana: Who is interviewing whom by the way?! I would love to ask more about the poetry/philosophy, but this is a finite interview. Maybe I can interview you again in 5 years’ time. The next question I have is about the use, or non-use, of earthier colours such as brown in your work. If you can also extend this to the colour work of Aura Soma that would be most illuminating. This question has been indirectly posed by Astrologer cj (Auntie Moon) in discussions about colour, and I thought it would be an interesting question. I have also noticed that green is not prominent in your work, but (apart from green shunyata) tends to appear as part of the rainbow and not as a basis for your mandalas. Barry: My understanding of colour is that there are at least two considerations. One is hue and the other is tone. Hue is the movement from red to violet and tone is the movement from white to black. Brown would be in the orange (hue) part of the spectrum and mid point between white and black (tone) or more or less depending on whether the brown was a light or dark version. Generally speaking I use “spectral” colours which are colours with very little or no black in them. This is because I am endeavouring to represent luminous vibrant states of consciousness and in my perception spectral colours accomplish this more effectively than colours with grey or black in them. I do appreciate the darker, earthier colours and they are present in my photographic work as part of my exploration and celebration of “earthly” beauty. Earthly beauty can also become heavenly beauty….. I refer you to the photos on my web site to see what I mean by this. The reverse is also possible – heavenly beauty can become earthly beauty. I see it in terms of vibration. With regards to Aura-Soma, which I am not really qualified to talk about, my understanding is that it recognizes that we all have a unique vibration and are drawn to bottles accordingly. So in my case I am drawn to the more pastel bottles. They do have some deep coloured ones but when you shine light through them they become much more luminous. They may well “birth” a brown bottle in due course. Who knows?! Perhaps it will be called the St. Francis bottle as Franciscan monks wear brown robes!!! This relates to the apparent absence of green in my work though it is present to a certain extent but is not dominant, but neither are several other colours. I have a bias towards the blue end of the spectrum. It is a question of vibration and resonance. We all vibrate on a certain frequency and are on a specific ray which has a colour associated with it. Lana: Your originals certainly have an incredible luminosity – the birthchart you painted actually glows in the dark like a fluorescent light. Moving on, you say in your book Sacred Circles that you were aware of your evolution in terms of the upward triangle of evolution representing the (my words) call of the divine and the downward triangle of involution representing the more grounded phase of evolution, which comprise the six-pointed star as described in the work of Alice Bailey. In earlier discussions you felt that my view of your description was a little awry. Can you put me right on this? And also if possible describe the moment when you had this realization in this lifetime. With regards to when I had this “realization” it was in the early ‘80s. As the general theme of this answer suggests it was preceded and succeeded by different realizations…. Lana: Have you an awareness of your Soul Lineage as an Artist honing your skills through many lifetimes? Barry: Although it seems I have rather exceptional recall of events in this lifetime I have limited memories of past lives. I have had a certain amount of past life recall in the way of visions, dreams, experiences of one sort or another alone or assisted by others but have no specific memories of being an artist prior to this lifetime. Ramana Maharishi says something to the effect that we are blessed not to know all the details of our past lives because we are already burdened by memories from this life time. Though having said that he himself did seem to know the details of his disciples’ past lives in some cases at least. The question however does raise the consideration of what we mean by “honing artistic skills”. I see art in the wider context of being “all of life”. I have never been that impressed or convinced by the idea that it is particular “art form”. In this wider sense I am sure we are all being refined over many lives to facilitate greater insight and enlightenment. I am aware that you work extensively with past lives so am not sure how the view expressed above fits into that. My feeling is that the path of awakening from the dream of this or another life involves tuning into “The Eternal Now”. I recognize that the past and future are of relevance and interest but only in the context of facilitating awakening. My understanding is that from the perspective of The Eternal Now movement forwards or back in time can occur without generating further impediments to Enlightenment and may as your work and studies suggest facilitate it. Lester Levenson says something to the effect that time is like a movie reel. We can see it all at once but for one reason or another we see it frame by frame. For me past and future can fit into the context of the previous question in that they may be considered to be complimentary concepts. Awakening or Enlightenment would correspond to the centre of the mandala. Lana: And so we come to the Now! I am looking forward to filling in my colouring book, and hearing more magical tales of labyrinths from you. What is your current focus? Barry: Well the last few months I have displayed on my round table the angel card of Healing. I usually select three cards and change them fairly frequently, but I decided to leave the healing one out indefinitely. So I guess that implies that my current focus is healing. It involved initially a series of “cleanses” and I may well do another in due course. Meanwhile I am as far as possible eating a “pure diet” which is vegan and has plenty of raw ingredients. There is the occasional “blip” when socializing but that is the general ongoing principle in terms of diet at the moment. On other levels healing is also ongoing and if one extends the term to mean “wholing” one could possibly say it is a lifelong endeavour. In terms of work and creativity I have not been that prolific the last year. I have however updated and extended my book Sacred Circles and also created a Line Mandalas for Colouring book which you refer to in your question. It is a quiet time in terms of giving workshops, commissions, sale of prints and so on. I am in the middle of painting a mandala that I began in Latvia in 2005 but am not sure how it will work out right now…..
As for Labyrinths, I am considering having a section in Sacred Circles which explores that theme as I have tuned into them a fair bit over the years. So life flows on and continues to flow on….. from and into the One in a Vast Cosmic Spiral.